We camp in wide open fields. We roll off the main road and bump down single-track until whenever we feel like stopping, then we set up our tent in the tall grass. We cook beans under a setting sun and wash dishes beneath a rising crescent. We sleep below a bright speckled canopy of satellites and stars. 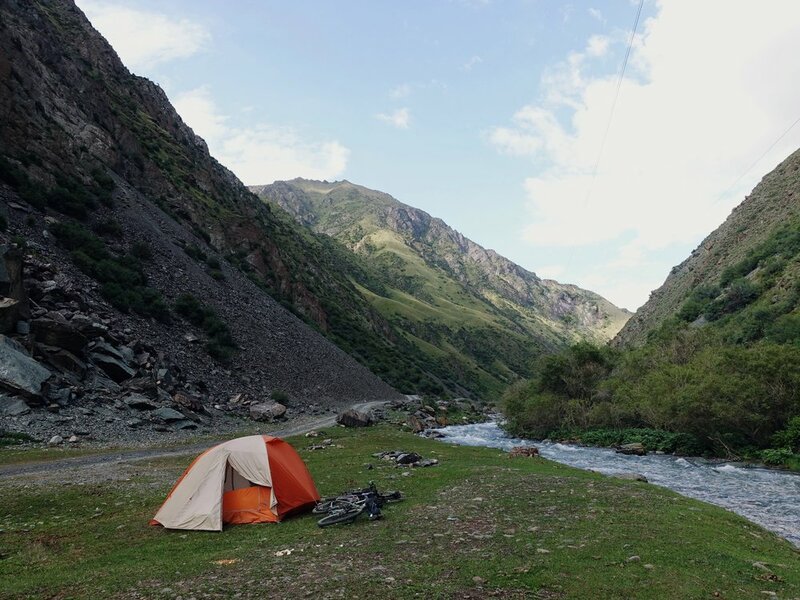 For four days, we cycle and camp along southern Kazakhstan. We move slowly, sleeping until nine or ten and lounging around for hours before packing up the tent. One morning we wake up late, gather our things, and hit the road around noon. A man and his son pull over in a truck around 12:03, rush over to our bikes, and hand us two ice cream bars. Welcome to Kazakhstan. We climb some foothills. We roll down the other side. We leave Kazakhstan and we enter Kyrgyzstan. Back in America, I lived in a tiny house. It was small and mobile and wonderful, and for five years I'd moved it around the District of Columbia, finding land and home and community in vacant alley lots and friends' backyards and neglected spaces. For a few years it was parked atop a concrete plaza outside an abandoned public school in the heart of the city, surrounded by a pop-up urban farm and garden center. It was an odd place to live, but a beautiful one. Tomatoes and cucumbers sprang up from garden beds dropped on the cement. A frenetic hive of bees alchemized honey fifty feet from the rocking chairs on my porch. On Tuesday and Thursday nights, fire-twirlers tossed flaming rods high in the air and caught them in outstretched hands as I cooked dinner in the kitchen. Fire practice, they called it. Something was always happening outside the window. Customers rifling through the seed bins in spring, locals hauling pumpkins home come autumn. In December, when the entire nursery was made over into a Christmas tree lot, I'd drink cider on the couch while chainsaws sliced errant branches from pine trunks. In summer the farm was at its busiest, and I'd watch from the window how the cabbage was coming in, when the peppers were due for a harvest, or whether the basil plants had any leaves to spare for whatever dish I was making. Of all the things passing by my window, one of the most familiar was Ruby, the farm manager. Ruby, watering strawberry starters. Ruby, building new garden beds with wood palettes and hay bales. Ruby, helping customers figure out which herb might be best for their windowsill. Ruby, giving life to this strange little concrete garden in the middle of the city. It was Ruby who'd invited me to park my house here in the first place. We'd moved the house in, one sweaty August day, and for a year or so Ruby and I saw each other almost daily—me leaving for work, her coming to open shop; her leaving work, me returning home for the evening. Seasons changed. Soil tilled and seeds planted. Cultivation and harvest. Ruby left the farm, then sometime later I Ieft the farm, and we fell out of touch in the way time and space can make such a thing happen to anyone. Last I'd heard, Ruby was in India. And then, just weeks ago, we'd connected on Instagram. I saw a few photos she'd taken in Bishkek and I said, Wait, we're on our way to Bishkek; are you living in Bishkek?, and she said Yes, I'm living in Bishkek! We enter Kyrgyzstan and cross the capital to go see an old friend. We have a brief but lovely time with Ruby. She's off to eastern Kyrgyzstan for several weeks in just a few days, but she really kindly puts all of her packing and planning aside to see us. Ruby greets us with smiles and hugs and fresh strawberry smoothies, and we spend a long afternoon catching up on what we've all been up to this past year. Ruby takes us to the bazaar to get a few things and shows us to the supermarket, where we load up on a week or two's worth of food for the long ride south. Later, we enjoy an evening picnic in the park. In the morning we make pancakes and chat a little more and pack our things. Ruby walks us down from her flat and gives us a big hug and waves us off as we pedal to the mountains. Ah, the mountains. So far in central Asia we've managed to avoid them. To lie low, to round the Tian Shan from Almaty to Bishkek in the flattest way possible. But now we are in Kyrgyzstan, heading south, and there is no more avoiding the mountains. They are the view over the handlebars. They are everything over the handlebars. They are dark and menacing and inescapable. They are tomorrow's problem. Today, we make it only as far as the base of the climb. We ride west on the flat, busy main road and veer off toward a less flat, less busy secondary road, and there we camp in a field next to some cows. We sleep, and tomorrow becomes today, and tomorrow's problem becomes today's problem. Today, we have a whole lot of climbing to do. The highest pass we've cycled to date was way back in Tanzania. The ride from Lake Malawi to Mbeya reached a little over two thousand meters, which isn't very high by global standards, but felt pretty high to us at the time. We slogged up its south face for two days and rolled into Mbeya ecstatic and windswept and proud but also very, very tired. That was then. Now, we are headed for the Too Ashuu pass, and it's quite a bit taller: 3,200 meters (10,500 feet) above sea level. That doesn't mean much if it's a long climb. Long, gradual climbs are no problem. I actually enjoy them. But it's not a very long climb. We'll gain over 2,000 meters of elevation in just fifty kilometers. The final 1,000 meters of ascent is packed into just the last twenty. That's 3,280 feet up in twelve miles. It will be steep. It is steep. We begin climbing and we climb all day. Twelve-percent grades. Sore knees. We ride alongside a small, raging river. Fresh snowmelt right from the mountaintops. It lunges downward as we crawl our way in the opposite direction. Up, through deep violet gorges. Up, past dark, mysterious caves. It is late and we are knackered. We search for a place to camp and have some trouble finding anything level along the narrow, winding road to the Too Ashuu. We press on toward the next dirt spur, hook right, and roll a little ways off the main route. Two Kyrgyz shepherds sit on horses while thirty or so cows graze next to the river. We ask them, in rudimentary hand gestures, if we might camp here amongst the river and the mountains and the cows. They point us to a dry patch of land a little down the road with marginally less cow dung than anywhere else. Enjoy! It's a beautiful, odiferous place to sleep. The road gets steeper. Just twenty kilometers to go, and so very much climbing left to do. We're already in our lowest gears—have been for ages—so there's little that can be done but to pedal harder. I huff and puff and silently curse all of the silly little things I have packed away in my panniers. Do we really need to be carrying three pounds of spaghetti? Are spare inner tubes all that essential? Would I make it up this mountain any more easily if the stupid Rubik's cube in my pannier that I haven't touched in months wasn't weighing me down so much? I pedal and fantasize about tossing gear into the river. I pedal and watch Lauren up ahead, working slowly but assuredly from one switchback to the next. I pedal and wonder just how much pedaling left I have to do, and just how much pedaling left my body can do, and I wonder which of those amounts is greater. It's summit or surrender. We stop halfway up one of our steepest sections so far. Roadworkers have labeled it a twelve-percent grade, but every hill in Kyrgyzstan seems to be marked a twelve-percent grade, like it was less work to just have one big batch of twelve-percent grade! signs made and drop them at the bottom of any and every hill and call it a day than to, you know, get all precise about it and start measuring angles. Earlier we rode a twelve-percent grade that felt like a five. This one feels like a twenty. We take an almond break and complain about the steep roads and watch dark clouds blanket a tall peak across the valley. We sit on a concrete barricade and discuss the podcasts we're currently listening to. We eat more almonds. While we sit on the ledge, shoveling nuts into our mouths, a dense cumulonimbus behemoth leaps across the valley. We don't notice it at first. We're busy kneading life back into our beleaguered knees. But then I stretch out and lean back and catch sight of the snowy summit across the way melting in the glow of a warm afternoon sun. Just moments ago this peak had been draped in cloud cover. Those clouds are now gone. I look up and there they are. Heavy. Swollen. Directly above. Raindrops splash onto our faces and we dive into our panniers for raincoats and dry bags. The rain turns to hail and before we're even back on the bikes we're soaked and freezing. As though this pass wasn't tough enough with clear skies. Thick pellets of slush. Numb fingertips. A mean charcoal sky and a steep, slippery road. Vans rush by and splash cold water on our bikes, our bodies, everything. Seven kilometers to the top. Six, five, four. We work our way around hairpin turns and roadside glaciers. Three, two, one. We have reached Too Ashuu. Almost. Not quite. Up ahead a long tunnel is pressed into the side of a bald, grey mountain. It's two miles long, this tunnel, and somewhere inside is the highest point from here to Osh—elevation: 3,200 meters. We'd warned about this tunnel. Don't cycle it, has been the general consensus. It is very lengthy, and very bumpy, and very dark. Very loud. It's hard to get much air exchange in such a long tunnel, and there are plenty of dirty, diesel trucks making their way through each day. They go in one side and out the other, but they leave their exhaust somewhere in the middle. Fumes, dust, carbon monoxide. At 3,200 meters, there's already a third less oxygen than you'd find at sea level, and the breathing's already tough. We aren't purists, and so we're perfectly fine hitching a ride through this tunnel. That had been the plan. But now we are here. It's wet and hailing and we are so very cold. We can stand here on the side of the road and beg a truck driver to make room inside for us and our damp bicycles and wait in the rain until someone says yes. Or, we can just go for it. It may not be pleasant within the depths of this mountain, but it will at least be dry. We turn on our lights, pull neck gaiters up over our faces, and pedal into the void.